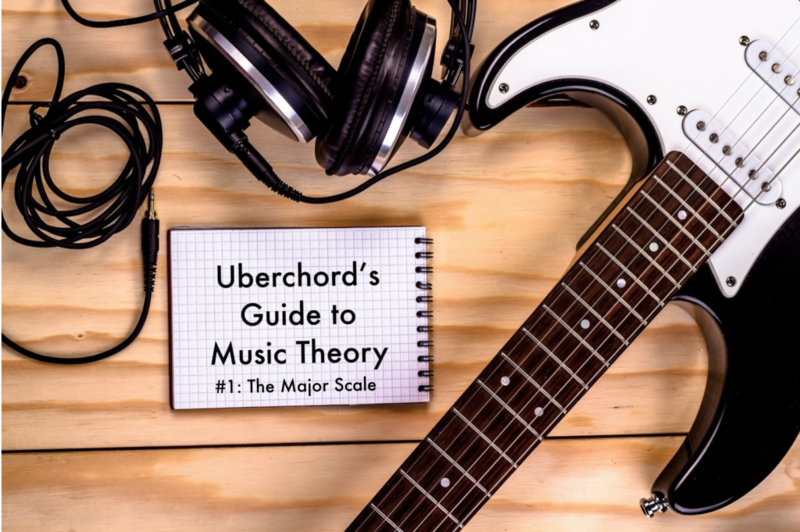 Welcome to our brand new Guide to Music Theory! Each week, we’ll supply you with essential information on music theory and delivery it in a way that is easily comprehensible. Whatever your level and whatever questions you may have, we can help. 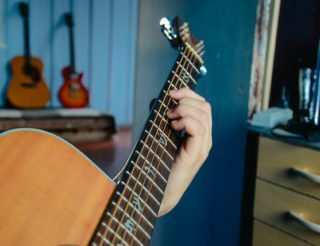 What is a chord? What are the most important scales? 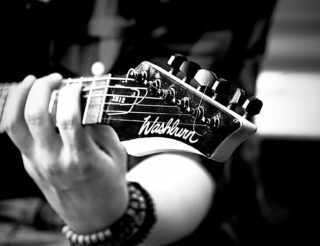 What is a major scale Guitar? How do they work, what are their names and what do we need them for? Why can’t Eb major be called D# major? Why is there an F minor chord in a song that is in the key of C? What is a degree, what do these roman numbers like I IV V mean? What is a tonic, a subdominant, a dominant chord? We will answer all of these questions and more. First of all: what is a scale? A scale is a number of ascending pitches. It usually ends on the same note where it started. Most scales consist of seven different pitches. This is the G Major scale. You can call it Ionian too, but if you just say “Major” everyone will assume you mean G Major because it’s so common. Why is it called G Major? “G” because G is the note where the scale starts and ends. If you haven’t seen sharps (#) before, please don’t worry. We’ll explain them in another blog post. We decided to display treble clef notation next to TAB so you get used to it. You don’t have to pay close attention to it, but we did this because many great guitar players complain that they can’t read treble clef well enough. 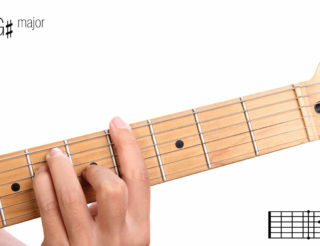 It has seven notes that move up in whole tones (two frets) and half tones (one fret). The last note is the same as the first, so we don’t count it. Take note that between the first and second note there is a whole tone (two frets), followed by another whole tone, then a half tone (one fret) between third and fourth note, then another 3 whole tones and finally a half tone again. This pattern will always be the same for any Ionian major scale, no matter which note you start. This of course means that you can start any scale on any note, not only on an open string. The Major (or Ionian) scale is like the great grandfather to most other scales and to most chords of its key. For example, all chords closely related to G are taken from the G Ionian scale, just as all the scales that belong to these chords are. All chords closely related to C and their corresponding scales are taken from the C Ionian scale and so on. We will soon get back to this. In the next post, we will introduce you to “The 12 Most Common Intervals“. thanks, stay tuned, and there will be plenty of other lessons! This was great! I’ve been looking for something like this, really just basic stuff. Perfect! I’m interested in the theory of your site but it does not play well with Android (not lollipop) anyway. Hi Gene, we are working to fix this issue ASAP. Thanks for pointing it out. thank you, we’re really glad to hear that. If you have suggestions for future topics let us know! thanks for the useful comment! We will be glad to improve. Is it possible for you to break down George Harrison’s ‘Never Get Over You’ in theory? First of all, we have two chords in this song, that are very similar but not really the same. That makes the song so special but also a little tricky to analyze. The key is D and both of these two chords change directly from D and back to D.
1. We often have a Gmin(maj7 9), consisting of G, Bb, D, F#, A (the melody). This is a subdominant function, that could be considered modal interchange, which means that it is „borrowed“ from Dmin. So a minor subdominant is used in a major key, always sounds nice. On the other hand by using the tensions maj7 (the F#) and 9 (the A) we still have a complete D triad in this chord. That makes it stay close to the tonic D.
2. One other often used chord is Gdim(maj7) with G, Bb, Db and F#. And sometimes that same chord is used with the bass moving from G to Bb to C#/Db. Only one note is different from the Gmin(maj7 9), the D vs. Db. THIS chord I would consider to have dominant function. It has the leading tone C# and all components match with A7b9 13. One possible chord symbol is A7b9 13/G. Looks complicated but sounds very good. Here again, the 13 (the note F#) keeps it well connected to the tonic D.
Next: How can we distinguish these two chords from each other? I easily recognize the Gdim chord from the guitar figure like it happens in the intro. F#, C# (sorry, enharmonic change in favor of the tonic D) and Bb (or A#). Interesting, that these three notes are an F# triad. One chord symbol that could be used here actually is F#/G. oh, and one more thing: at the end of the bridge D (A/C#) D: there is a 6/4 bar, so the Gmin after that comes of a little surprise. From here, all that happens happened before. I hope this was helpful! If there’s any more questions, let me know. Dan from http://musictheorylessons.net here. I think you’re a fantastic educator! This is a really clear post on major scales. As a high school music teacher, I must teach this concept at least 10 times per year. I am constantly striving to look for new material that really explains new musical concepts well, with visuals and audio if possible. Thanks for sharing this post, I definitely have new resources in my tool belt to attack this concept! thank you so much for the encouraging feedback. I’ll be glad to check out musictheorylessons.net!